Why I read this book: This series is really fun and unique. Also Mary Chase and Jack Talent were awesome side characters in the last three books. Here is the funny thing about series like this. The books come out so far apart that it is impossible for me to remember all of the details. So far, this hasn't been too much of a problem for me, but when I started reading this book, I knew I was forgetting some crucial facts. But I am getting ahead of myself. 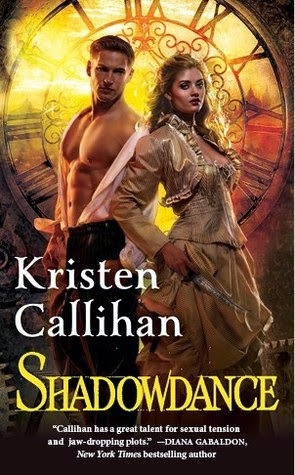 Shadowdance is the fourth book in Callihan's Darkest London series. I actually have reviewed all three of the previous books Firelight, Moonglow and Winterblaze. This fourth book is the first that moves from the three main sisters on to some of the awesome secondary characters: Jack Talent, a boy turned man during the series who always had an air of mystery about him, and Mary Chase, and awesomely badass and strong woman who is a Ghost in the Machine or someone who has died but shortly their after blessed with life again with a golden mechanical heart. The first few books brought the supernatural elements in this steampunk series on slowly. There were always some, but we didn't get into the deep stuff until book three, Winterblaze. Those details were what I was forgetting when I started this. I was mixing this series up with Bec McMaster's London Steampunk series (also really good), and it was frustrating the hell out of me. You see, in the preface, I was wracking my brain trying to remember if I should know what was going on. Unfortunately I couldn't find a spoilery enough review of Winterblaze to kick-start my memory of what happened with Winston (I still can't remember to be honest). Eventually I just said screw it and kept reading. If I hadn't have been so impatient, I would have realized that Callihan did a good job of reminding the reader of details you needed to know when you needed to know them, but not to go into too much detail and recap the other books. The main plot deals with Jack and Mary, two people who have outward animosity but inward attraction, being forced to work together to solve a series of murders. They need to find the supernatural killer and bring him to justice. There is of course a twist to all this that happens pretty early on that makes the interactions have an interesting edge to them. Jack and Mary have some awesome heat and tension between the two of them, but once they finally admit their feelings it gets gooey lovey-dovey quickly. I have to admit that I missed the biting wit and sarcasm from when they were fighting all the time. Tey are still a cute couple and I am happy for them and all, it's just a personal preference to like the stories with passionate sparks flying between them. In addition to the plot above we get the introduction of angel supernaturals, which is pretty cool. This world has all the supernaturals you can think of apparently. The rules are endless, which I guess is what frustrates me. It's hard keeping track of everything (especially when you are reading two similar series). Seriously. I need to start taking notes on what happens in books that I know are going to turn into long series. That is one great thing about Elizabeth Hoyt's Maiden Lane series... she has like a character guide and important tidbits on her website, a godsend for forgetful me. I'd love that for this series! You don't see too much of the characters from the other books, which I was fine with, but we get a great setup for the next couple that I am excited to read about. Overall I was entertained. The story was enough to hold my interest in the series. It may not be my favorite as the couple lost a little of the bite I loved toward the end. But the series is still one of my favorites and one that I would highly recommend to steampunk paranormal romance lovers. I have been meaning to start this series for a while as I have the first two books, so hopefully I will finally get some motivation to pick it up and read them since they sound fairly decent books and I am a huge paranormal romance fan! Great review. A golden heart? Interesting. I've never seen this book before, but the titles of the previous ones are intriguing, although I'm not in love with the cover.